24*7 Menu ake away option . ONE OF THE INTRESTING PART IS FOOD PRESENTATION & QUALITY OF FOOD & VALUE FOR MONEY. 1) Most of the food was good @ Lunch buffet. 2) Great Ambiance and atmosphere. 3) Food arrangement was good. 4) Curd Rice was over chilled and we all felt it was carry over from previous day and was evident. Refilling of desserts was slow. Suggest to improve the varieties in the buffet, for ex. must need to add rice items which is attractive and tasty rather than jeera rice, plain rice etc. 5) Initially booked table for 25 to 28 people but turned out to be 31. However restaurant struggled to accommodate all in a same place. There wasn't enough space and table/chairs to quickly arrange and the team has to spread across different tables, and some even in high chairs etc. Also the service in the table needs more improvement for example, even the basic things like serving water in a glass was not done and have to ask to get the same. Service needs improvement. The ambience was great, service was great but the food was ok. 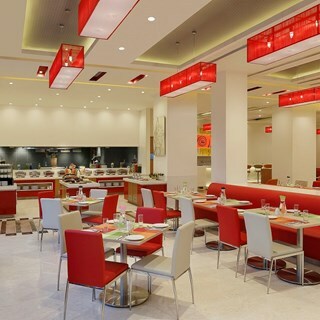 I went in for a lunch buffet and the variety was not much.. the food was decent but I was expecting a delicious food! A little disappointed with food. However, u can certainly hop in for a quite, peaceful lunch that serve a decent food.